Just as gingham made its mark this past summer, bold graphic checks are having their moment this winter. This jacket’s plaid is definitely inspired by the classic pattern known as a Buffalo Check. And while that might bring visions of lumberjacks to mind, the boldness of big checks combined with two alternating colors elevate this wardrobe essential from everyday to every day, please! The rest of this look is built around some of my more casual, shop-my-closet favorites, but I could easily see this jacket belted over a crisp white shirt, then paired with slim black pants and black booties. Or punching up some of the many grey pieces that are my daily go-tos. Or, how about a pop of red! 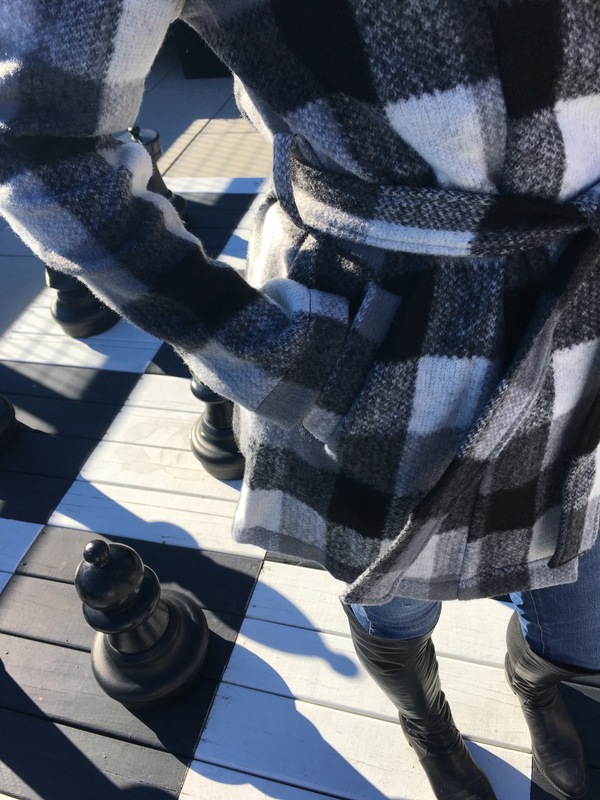 As you can see, a checked jacket is that versatile piece you’ll reach for again and again. And this one is a steal! 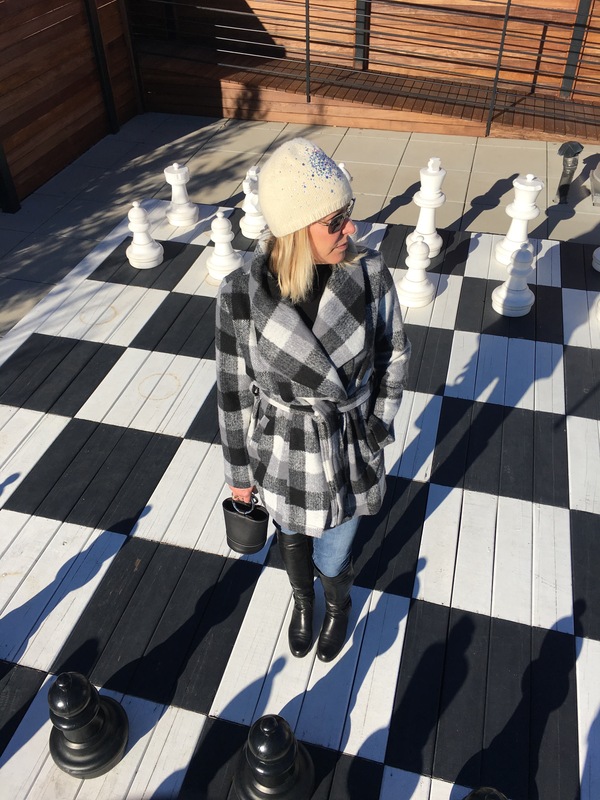 While this jacket is a new wardrobe addition, the rest of my look pulls together tried-and-true pieces that are so timeless I’m happy to wear them over and over. If you don’t own a black cashmere or merino turtleneck or you need a fresh version of the one you do own, the current winter sales make this the time to stock up. I’ve linked some of my current favorites below. I like the body consciousness and longer lines of this turtleneck, because that makes it a little more polished on its own and also a great layering piece. I’ve worn this turtleneck countless times under a slip dress, which ups the season-spanning versatility of both pieces. Surprise…not…Madewell jeans make my denim must-have list every time. You seriously cannot beat their combination of style, quality and fit. They are designed to flatter every body type and based on customer reviews they do just that time and again. These are skinnies without the squeeze — I promise! If you haven’t treated yourself to a pair, I highly recommend you do. To finish off this look, I reached for a cashmere beanie (previously seen here) that’s embellished with a bit of Swarovski bling. I am now a fully committed hat lover, because you can (and should) keep your noggin warm and there are so many fun choices out there. 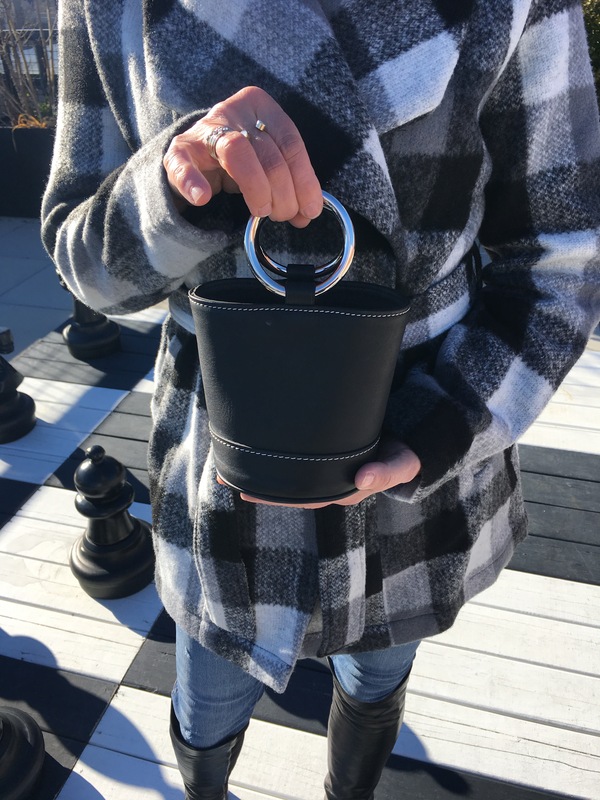 My mini bucket bag is a beloved accessory because, well, because it’s just so dang cute and chic. And it’s currently on super sale, so if you’ve been holding off now might be the time to indulge. The same goes for these Stuart Weitzman OTK black boots. They are insanely popular, because they are insanely flattering and so very easy to wear. While they typically do not go on sale, these boots are an investment that will pay dividends every time you wear them. And I mean, year after year. Seriously, this pair of SWs is at least 5 years old, still looks brand new, and I can’t count how many times I’ve happily worn them with everything from jeans to a little black dress. It’s been a while since I posted, because I guess I’ve been struggling with “Blogger’s Block.” Not sure if that’s an officially-recognized “condition,” but this past month or so I’ve basically been questioning what truly inspires me and what would inspire you. I’ve also been on a pretty intensive closet cleanse (post on that to come but still actively “cleansing!”), so I have been trying to keep my shopping to a minimum. Which makes coming up with posts that incorporate new trends/looks/items a bit tricky. Not impossible, just more challenging. Anyhoo…I decided the best way to beat this funk was to get writing and get back in touch with all of you. There, I feel better already! As always, thank you all for following, reading, commenting and shopping my links. While I absolutely promise not to turn Life’s a Spritz into a constant sales pitch, shopping directly from my links is one way I am able to monetize my blogging. I earn a small commission on anything you buy, but only if you complete a purchase during that click-through session. If you put something in your cart and come back two weeks later that doesn’t count. But if you need time to mull a purchase over (and we all should do just that! ), you can always go back to a post and click on a link again. We’re not talking big money, but I really do appreciate your support if you’re in the mood to shop. Also, don’t hesitate to let me know any and all topics you’d like my take on over the coming year. As I said, inspiration can sometimes be elusive, so I appreciate your support there, too! Jacket (A New Day x Target) Alternatives here, here and here. Turtleneck (Kit & Ace, old) but here’s this year’s version (on sale). Also have my eye on this (limited sizes but SUPER sale with code CLEAROUT) and this (25% off with code GOFORIT). Jeans (Madewell, old) but tempting new options here and here (both 40% off with code DOUBLEYAY). 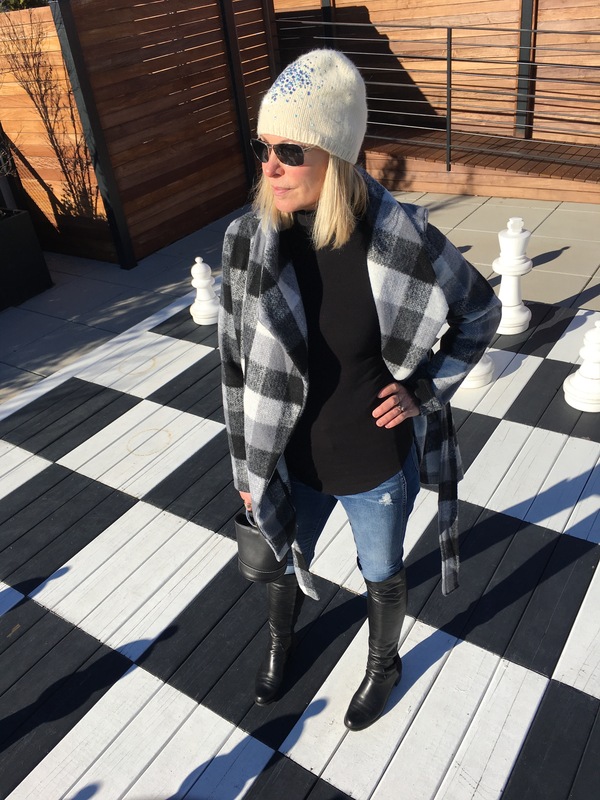 Beanie (Erica Mollinari, old) but love this, this (25% off with code GOFORIT) and this (with matching hand warmers!). Bag: (Simon Miller, 40% off) More affordable here and here (LOVE IT!). Boots: (Stuart Weitzman) On sale SWs here and here (limited sizes). Well-priced alternatives here and here. Oh my ! 18 inches of snow? Yes keep noggins warm – and I hope you keep on blogging. You remind us all that life is a spritz— and that’s always a huge inspiration. Thanks, Kristin! Think I’ve got that Blogger’s Block in check now!! What a great look….jacket, jeans, boots…..one of those outfits that goes on and just feels right immediately. 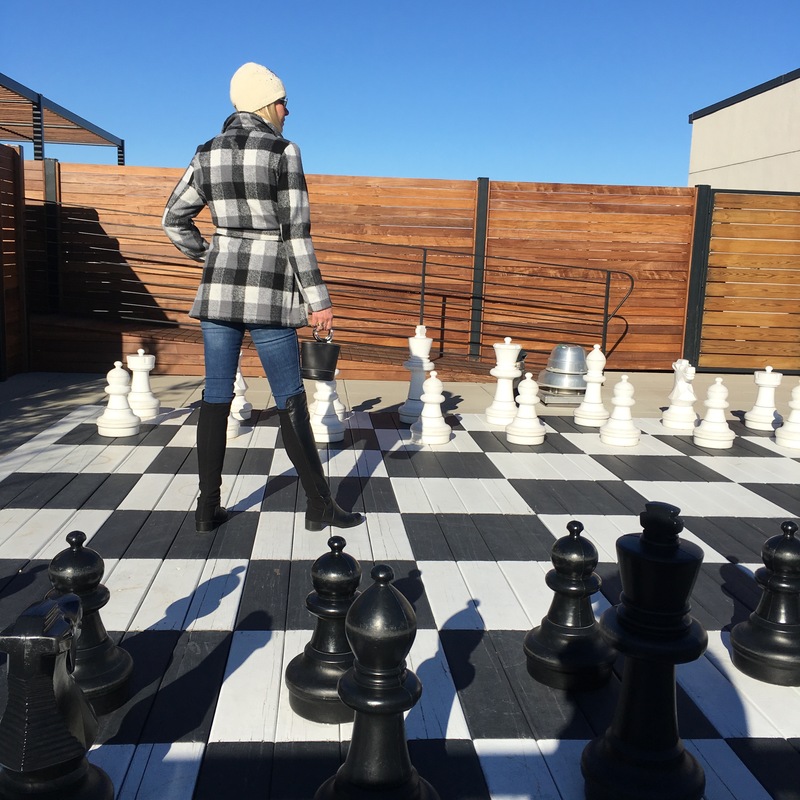 And genius to shoot the look on your roof with the chess board! Hope you’re not snowed in too long! Thank you, Kathy! 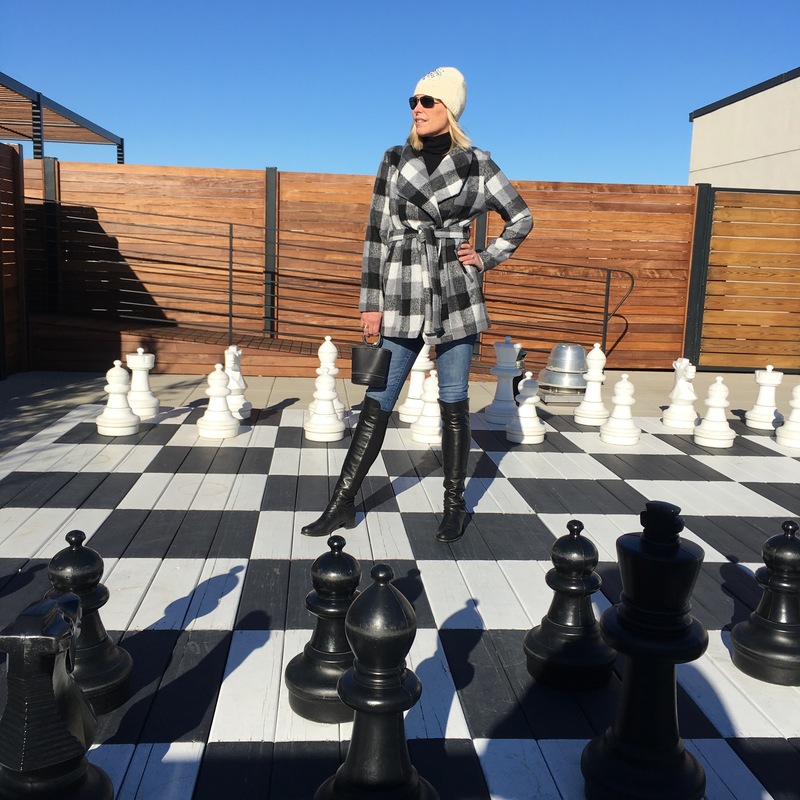 That chessboard is a pretty great location, and has appeared a few times in the blog. Probably more to come. We escaped the snow and sub zero weather, and are now much warmer in JC. As always, thank you following and commenting!